The public continues to express conflicted views of Islam. Favorable opinions of Islam have declined since 2005, but there has been virtually no change over the past year in the proportion of Americans saying that Islam is more likely than other religions to encourage violence. As was the case a year ago, slightly more people say the Islamic religion does not encourage violence more than other religions (42%) than say that it does (35%). Amid controversy over the proposed construction of an Islamic cultural center and mosque near the former site of the World Trade Center, more Americans agree with those who object to the building of the center than with the supporters of the project (51% to 34%). At the same time, 62% say that Muslims should have the same rights as other religious groups to build houses of worship in their local communities; just 25% say local communities should be able to block mosques in their area if they do not want them. The new poll by the Pew Research Center for the People & the Press and the Pew Forum on Religion & Public Life, conducted Aug. 19-22 among 1,003 adults, finds that opinions about Islam are less favorable than in the summer of 2005. Currently, 30% say they have a favorable opinion of Islam while slightly more (38%) have an unfavorable view; nearly a third (32%) offer no opinion. In 2005, slightly more expressed a favorable opinion of Islam than an unfavorable opinion (by 41% to 36%). As in the past, there are substantial partisan, educational and age differences in opinions about Islam. By more than two-to-one (54% to 21%), Republicans express an unfavorable opinion of Islam; the balance of opinion among independents is negative (40% unfavorable vs. 28% favorable). Among Democrats, favorable opinions of Islam outnumber unfavorable ones (by 41% to 27%). While those who are younger than 50 have mixed views of Islam, the balance of opinion is more negative among those older than 50 (44% unfavorable vs. 24% favorable). By a margin of 47% to 28%, college graduates express favorable opinions of Islam; pluralities of those with less education express unfavorable views. 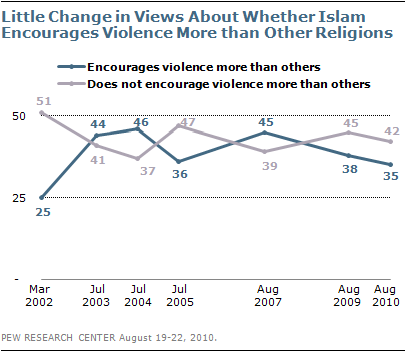 Opinions about whether Islam is more likely than other religions to promote violence have fluctuated since 2002. In March of that year, 51% said that Islam does not encourage violence more than other religions do, while only about half as many (25%) said that it does. Since then, opinions have been more closely divided. The current measure is comparable to 2009 and 2005, when pluralities said Islam was no more likely than other religions to encourage violence. There are similar patterns in opinions about whether Islam encourages violence as in overall views of Islam. However, there is no political or demographic group in which a majority says that Islam encourages violence more than other religions. By a modest 47% to 38% margin, more Republicans say Islam is more likely to encourage violence. Independents are evenly divided (38% say it does encourage violence more, 38% say it does not). Democrats, by about two-to-one (50% to 24%), say Islam is not more likely than other religions to encourage violence. If anything, there are even starker partisan and age differences over the proposed construction of an Islamic center and mosque a few blocks from the site of the former World Trade Center. By more than four-to-one (74% to 17%), Republicans say they agree more with those who object to the building of this center; half of independents (50%) agree more with the center’s opponents while 37% agree more with those who say it should be allowed. By contrast, more Democrats agree with the center’s supporters than its opponents (by 47% to 39%). Those 65 and older, as well as those 50 to 64, agree more with the opponents of cultural center and mosque by wide margins. Those younger than 30 agree more with those who say it should be built, by 50% to 36%. While there is opposition to building the Islamic cultural center and mosque in New York City, most Americans (62%) say Muslims should have the same rights as other religious groups when it comes to building houses of worship in local communities; 25% say that local communities should be able to prohibit the construction of mosques in their area if they do not want them. Large majorities of Democrats (74%) and independents (65%) say that Muslims should have the same rights as other religious groups to build houses of worship. Republicans are closely divided: 47% say Muslims should have the same rights as other religious groups while nearly as many (42%) say local communities should be able to prohibit the construction of mosques if they do not want them. Majorities of all age groups – except for those 65 and older – think that Muslims should have the same rights as other religious groups to build houses of worship. Fewer than half (48%) of those 65 and older express this view, while 33% say local communities should be able to block the construction of mosques. 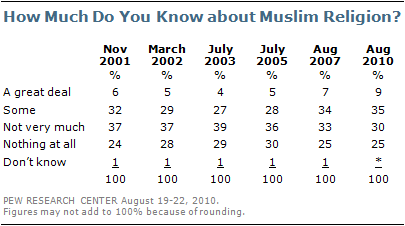 As in previous Pew Research surveys, most Americans say they know little about the Muslim religion. Currently, 55% say they do not know very much (30%) or know nothing at all (25%) about the Muslim religion and its practices; 35% say they know some about the religion while just 9% say they know a great deal. These numbers are largely unchanged from 2007. Similarly, there has been little change in the percentage of Americans who say they know someone who is Muslim. In the new survey, 41% say they are acquainted with someone who is Muslim; comparable percentages said they knew someone who is Muslim last year and in 2007. College graduates are far more likely than those with less education to say they know at least something about the Muslim religion. A majority of college graduates (63%) say they know some or a great deal about the religion, compared with 48% of those with some college experience and just 31% with a high school education or less. Most college graduates (62%) say they know someone who is Muslim; that compares with 44% of those with some college experience and 26% of those with a high school education or less. As in the past, people younger than 50 (49%) are far more likely to be acquainted with a Muslim than are those 50 and older (31%). Results for this survey are based on telephone interviews conducted under the direction of Princeton Survey Research Associates International among a national sample of 1,003 adults living in the continental United States, 18 years of age or older, from August 19-22, 2010 (672 respondents were interviewed on a landline telephone, and 331 were interviewed on a cell phone, including 120 who had no landline telephone). Both the landline and cell phone samples were provided by Survey Sampling International. Interviews were conducted in English. The combined landline and cell phone sample are weighted using an iterative technique that matches gender, age, education, race, Hispanic origin, region, and population density to parameters from the March 2009 Census Bureau’s Current Population Survey. The sample is also weighted to match current patterns of telephone status, based on extrapolations from the 2009 National Health Interview Survey. The weighting procedure also accounts for the fact that respondents with both landline and cell phones have a greater probability of being included in the combined sample and adjusts for household size within the landline sample. Sampling errors and statistical tests of significance take into account the effect of weighting. The Pew Research Center for the People & the Press is an independent opinion research group that studies attitudes toward the press, politics and public policy issues. The Center’s purpose is to serve as a forum for ideas on the media and public policy through public opinion research. In this role it serves as an important information resource for political leaders, journalists, scholars, and public interest organizations. All of the Center’s current survey results are made available free of charge.